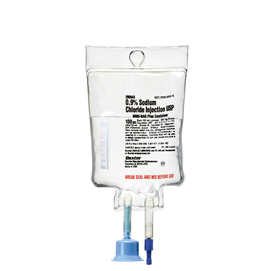 As published by the FDA FOR IMMEDIATE RELEASE – December 11, 2014 – DEERFIELD, Ill. – Baxter International Inc. announced today it voluntarily initiated a recall in the United States of two lots of 0.9% Sodium Chloride Injection USP in 100 mL MINI-BAG PLUS Container to the hospital/user level. The recall is being initiated as a result of two complaints (one per lot) of particulate matter that was identified as a fragment of the frangible from the vial adapter. The issue was identified upon standard visual inspection prior to patient administration. Intravenous administration of a solution containing sterile particulate matter may lead to adverse health consequences. The extent and severity of harm depends on the size, number, and composition of the foreign material, and the patient's underlying medical condition. In the absence of in-line filtration, particles may cause: local vein irritation, inflammatory reaction, aggravation of preexisting infections, allergic reactions, and systemic embolization (blockage of blood vessels, which can result in stroke, heart attack, or damage to other organs such as the kidney or liver). There have been no reported adverse events for the affected lots. Unaffected lot numbers can continue to be used according to the instructions for use. According to the 0.9% Sodium Chloride Injection USP in 100 mL MINI-BAG PLUS Container product labeling, the product should be inspected visually for particulate matter and discoloration whenever solution and container permit. Baxter has notified customers, who are being directed not to use product from the recalled lots. Recalled product should be returned to Baxter for credit by contacting Baxter Healthcare Center for Service at 1-888-229-0001, Monday through Friday, between the hours of 7:00 a.m. and 6:00 p.m., Central Time. Unaffected lots of product are available for replacement.